2018: In 18 games (two starts), Jones finished with 13 defensive tackles, 14 special teams tackles, one interception which he returned 70 yards and one onside field goal recovery. 2017: In 12 games (1o starts), Jones finished with 50 tackles, including three special teams tackles and one interception which was returned for 19 yards. In the West Semi-Final, Jones recorded four tackles. In the West Final, Jones recorded two defensive tackles. 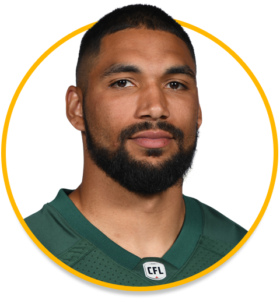 2016: (Saskatchewan) Jones played in 13 games for the Roughriders and accumulated 18 tackles, 11 special teams tackles, and one forced fumble. 2015: Jones played the 2015 season in Edmonton and played in all 18 games where he recorded 25 tackles and 13 special teams tackles. College: A two-year starter at the University of Wyoming, Jones recorded 162 tackles and four sacks in 25 games. Jones was also named a team captain during his senior year in 2012.